As always you have to know a few basic things, again YOU HAVE TO KNOW. Without all the numbers meaning anything to you, you can not make a right decision. So what is an antenna then? The transmitted energies by the transmitter had to be transferred into Electromagnetic waves and broadcasts away from the antenna. For receiving the same trick must be done but then opposite. Electromagnetic waves need to be taken from the sky. Transferred in to small amount of hf energy and "decoded" by a receiver. The one who would do this job the best, would be the best antenna. In real life it sadly is not possible to transceiver under all angles equally. The only antenna which can receive and transmit under all angles equal is called an isotropic. This antenna only is real in our minds it can not exist in real life, this is due to the influence of earth. You can imagine the radiation pattern of an isotropic antenna as a football in which the antenna is the center point of the ball. This type is used quite commonly because it is the only one which radiates in all directions equal you can use it to compare antennas. to use it as a standard for gain. The same antenna but now in real life, we have put the earth beneath it. These simple diagrams are fast made, but in real life it is just like this...there is no antenna which produces a nice round pattern it is quite a lot like the picture to the left. If you would say my car runs 10km faster everybody wants to know...it runs 10 km faster then what? In the antenna world its the same. If you have an antenna and want to know if it works better you will have to compare it to something. The black line shows a diagram from a small yagi (3 elements) looked at it from above. The red line shows a diagram from a big yagi (6 elements) looked at it from above. 3 el 6 dBD gain....6el 8 dBD gain the blue line is thus 2 dB s difference. 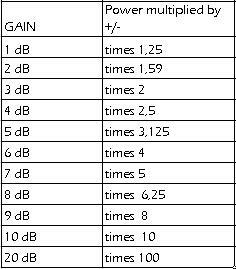 This is done in decibel, abbreviated dB we have two variants in these. dBD this is gain measured to a dipole. dBI this is gain measured to an isotropic. The isotropic was mentioned earlier it radiates in all direction equal, there for it is probably the best way to compare another antenna with, but wasn't a real antenna. The dipole. did not came across so far, this antenna has a gain over an isotropic of 2,14dBI. Please be aware that when manufacturers give a specific gain to an antenna without the extension D or I (dBI/dBD) it is of no real value! ( you must have something to compare it too!) When I say that the wooden stick I am using for transmitting has 15 dB gain on 11 meter I am right! And of course do remember: if you would use dBI your numbers are always 2,14 higher then dBD. I am afraid that is not all. Gain is measured in free space. I already mentioned that the ground under your antenna, and then especially the height you have your antenna above this ground is of great influence of gain. We all agreed on saying that gain should be given in free space or you should mention the height of the antenna. A good example of how it should be done is DXSR under the chapter manufacturers. Bad examples are often found just think of all the half wave verticals with the big gain numbers. And finally some add gain of both antenna systems when they use cross yagis or an equivalent. For example if we would take a 4 elements yagi horizontal and one vertical (so 8 elements total) we could say the total gain of the system is 15dBD gain, a better way would be 7,5dBD Vertical or Horizontal. So conclusion : You can be easily fooled! When you have a dipole. and 100 watt and you have an 3 elements antenna with 6dBD gain you would need 400 watt on the dipole. to produce the same signal as with the beam. 0,097 times 10 = 0,97 dB loss ! That is right because 1 dB was about a multiply of 1,25 So when we are talking about loss it is not times but you could divide it. 100 divided by 1,25 = 80 watt. A beam antenna has besides gain another interesting feature it is called the front to back often shortened as FB. It means nothing more than: How much weaker a station comes through at the back of the antenna compared to the front. Looked close at this sentence you will notice it is compared to the front of the antenna, this is what many people forget. It is only logical that with high Gain beams the Front to Back is higher as well cause the forward gain is higher! The front to back is also expressed in dB, without an additional remark like dBI or the D for the above named reason. There are ways to improve the F/B, you could redesign the entire yagi of course but you could also add additional Reflector elements as we see quite often in the FM-radio spectrum (fuba-yagi) or place an additional director in front of the radiating element as done in the extra short versions described in chapter BEAMS. Some manufacturers have extra reflector kits available for the "moonraker/lightning" series, your front to back will only become worse so do not use them. This is where our gain primarily comes from! We can distinguish two in beam width the horizontal or vertical. Take a look at the radiation pattern of a yagi below. In the first picture we can see the HORIZONTAL BEAMWIDTH,(looked from above at the antenna) also called azimuth pattern. The angle between A and B given in degrees are the points where the signal is 3dB weaker then the main lob.